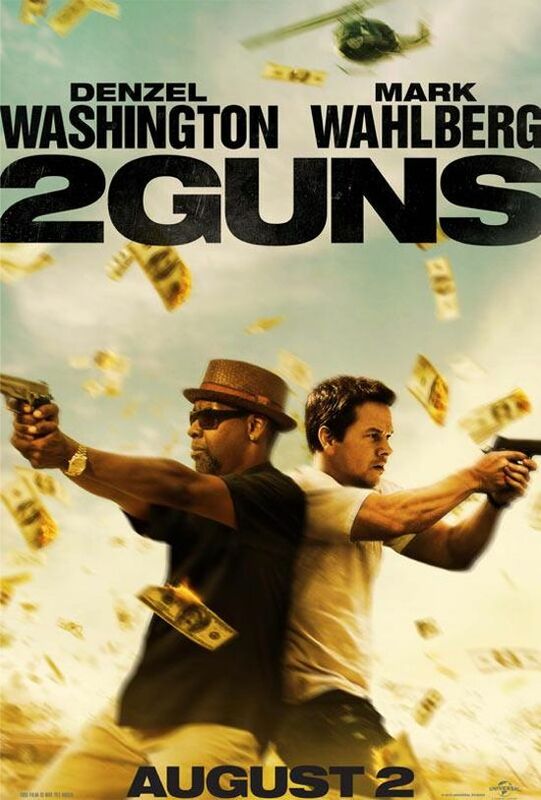 WARNING: This post contains some key plot spoilers for the movie 2 Guns (2013). I was pleasantly surprised by this movie. I had found the trailer interesting, but I was also skeptical. Both Denzel Washington and Mark Wahlberg are big names in the industry, and for the most part, they’re the main draw to their respective films. I had wondered how their dynamic would be on screen together, and the surprised me with their on-screen chemistry. They seriously looked like they were having so much fun in their roles. The movie was also a lot more hilarious than I thought it would be. This is one of those movies where all the good jokes, thankfully, have not all been given away in the trailer(s). Another surprise for me was James Marsden. I really enjoyed his acting here. I don’t think I’ve seen him in many serious roles, so to see that he could pull one off was actually pretty refreshing. In fact, I’m not sure if I like him better in darker roles or in cheesy ones, like when he was Prince Edward in Enchanted (2007)—I thought he was pretty hilarious in that one. This movie, I thought, had just the right balance between intense and hilarious. I think the side story of Washington and Paula Patton’s characters panned out pretty realistically, and I think they had a few pretty good lines together. Wahlberg also had some hilarious moments as a womanizer that had me and a handful of other people in the theater I was in laughing. I definitely had to close my eyes several times during the gun-violent scenes, but I’ve never been very good at stomaching those in general anyway. For those that like that kind of action, rest assured, there’s plenty of it. The title, in that sense, does not disappoint. There were also plenty of over-the-top action scenes that people will likely enjoy. One of the last few scenes with the raining money for some reason reminded me an awful lot of the opening/closing of Slumdog Millionaire (2008). The very last scene is part of a running joke from early on in the movie, and I thought it was a nice finishing touch that definitely had me laughing. Of course, like all movies, this one was not without its imperfections, but I thought it did pretty well for what it was. My only hope is they don’t ruin it by trying to come up with a sequel. I can see that there’s potential room for one, but it would be nice to just have movies like this one not jump on the sequel train. Though I enjoyed myself – I gave it a lesser rating than you did. As a cop/buddy film it worked fine. And if it had been some lesser actors I might have given it a pass. I like Patton and I also liked the concept of three separate and distinct and COMPETING villains. Long time no see! Good to be hearing from you again! You have the review of the film up yourself, I take it? I’ll be sure to check it out. 🙂 And yes, I also enjoyed the competition going on with the villains. Kept things interesting because even though you know who’s going to come out on top in the end, it still does a fair job of at least trying to keep you guessing.